I started “$5 Fridays” to inspire people to support non-profit animal advocacy organizations. Every Friday, I select an organization and kindly ask everyone to donate $5 to it. Many people don’t have a lot of money to give but most people have a little. If we all donate a little, it will add up to a lot and make a big difference for animals. 2) Post the name of the organization and your donation amount in the comments section below so we can keep a running total of donations (i.e. “I donated $5 to Mercy for Animals”). I confirm our total with the organization the following day. Animal rescue and advocacy organizations rely on our generosity to sustain their work. Whether it’s providing humane education to students, designing and printing veg starter kits, launching online pro-animal advertisements, employing undercover investigators, organizing boycotts or protests, advocating for pro-animal legislation, or providing medical care, food, and shelter to rescued animals, it costs money to run these organizations. Our donations directly help them save more animals’ lives. Thanks to your teamwork, our new $5 Friday total is $4,209 donated to help animals! Let’s keep it going! 1. A $5 donation to Mercy for Animals will result in 2,695 people seeing one of their pro-veg advertisements, 42 people reading more about plant-based eating or seeing a factory farm cruelty video, and three people pledging to become vegetarian or ordering a Veg Starter Guide. 2. Their undercover investigations and other pro-animal videos generated approximately 100 million views this year, exposing people to the horrors of animal agriculture and the benefits of plant-based food. 3. The animal agriculture industry fears them. 4. They think critically about how to achieve progress and put what works ahead of what feels good. 5. If you really want to know why Mercy for Animals deserves your support, read this article. Let’s show the Mercy for Animals team how much we appreciate everything they do to make the world a more humane place for animals by empowering them to do even more. Click here to make your $5 donation directly to Mercy for Animals. Thank you for participating in $5 Friday. I donated $5 to Mercy for Animals. I so appreciate what you do to help animal advocacy organizations. Thank you. I am the founder and Executive Director of Ching Farm Rescue & Sanctuary. We are located just outside of SLC, UT. We advocate for a cruelty free lifestyle and currently have 200 rescued farm animals that we care for. We are all volunteer run and totally run on donations. I am wondering if you might consider us on one of your $5 Fridays or other fundraiser. Thank you for everything you do to help animals and for your kind note. I have a list of more than 100 organizations eligible for review so I haven’t been soliciting new nominations but I’ll add your sanctuary to the list for future consideration. I just donated $5.42 TODAY… (also picking up the $.42 processing fee so 100% of my donation goes to saving animals)… and opted for the ongoing MONTHLY donation. $65.00 over the next year? I won’t even MISS it! Andrew: Thanks again for coming up with this way for so many to give a little bit… each and every Friday! Awesome Jack! That’s great news! Thank you also for becoming a monthly supporter of Mercy for Animals! Donated $5.42 to MFA. Thank you for supporting this wonderful organization! Thank you very much Sandra. That’s very kind of you! 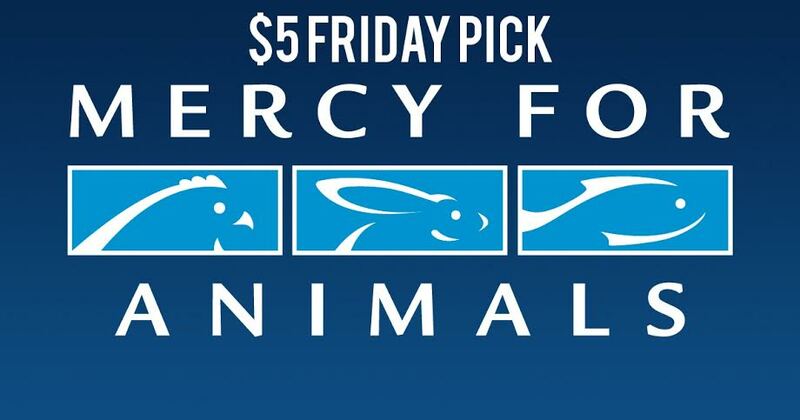 We finished this week’s $5 Friday with $200 in donations for Mercy For Animals and one individual who signed up to donate monthly to Mercy for Animals. What does your $200 in donations mean for the animals? 1) Approximately 107,800 more people will now be able to see one of Mercy For Animals’ pro-veg advertisements. 2) Approximately 1,680 more people will now read more about plant-based eating or see a factory farm cruelty video. 3) Approximately 120 people will pledge to become vegetarian or order a Veg Starter Guide. That is amazing. You made a big difference. Our new $5 Friday donation total is an incredible $4,409. Thank you to everyone who participated. I hope to see you next Friday.